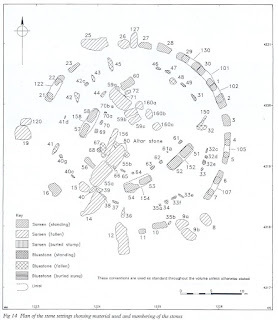 I recently blogged about The Mystery of Stone 42c And The Lead Encased Buried Stone and rather summarily dismissed the notion of lead encased buried stones in the circle of Stonehenge. Well I was wrong. 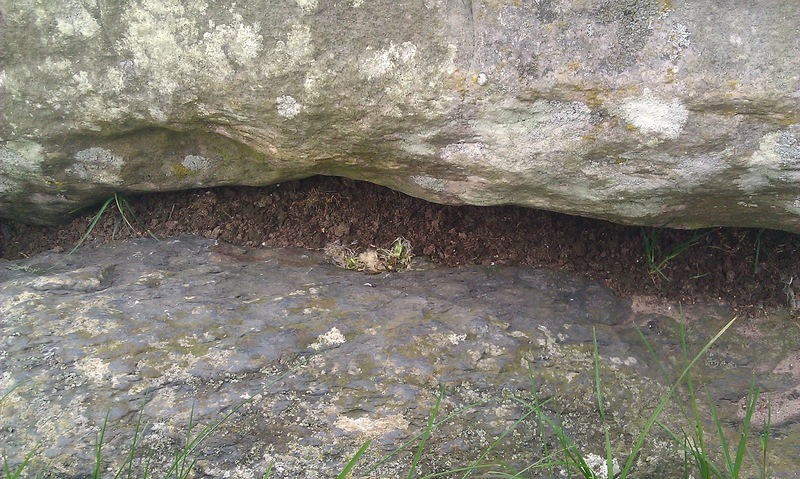 In the recent dry weather the area where the large lead encased stone mentioned in the blog post is purported to be does sound rather hollow and drum like... but that is an investigation for another day. It was excavated by Atkinson in 1956. 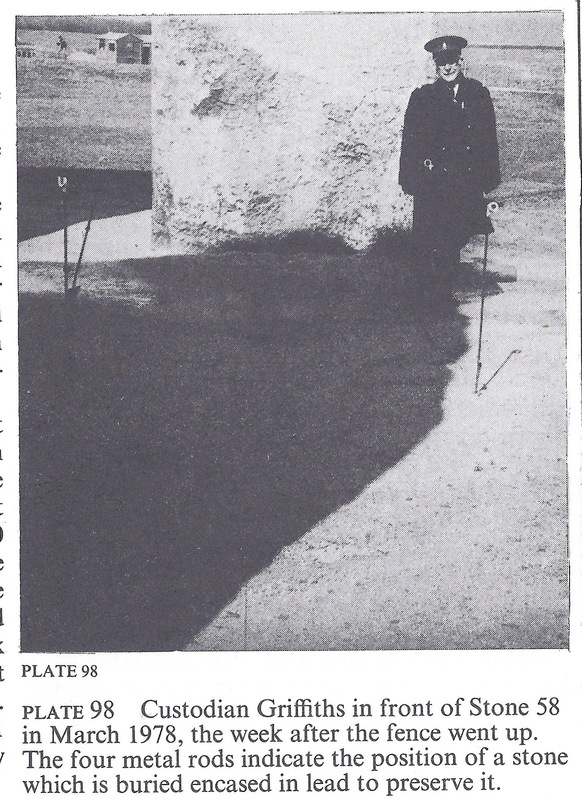 But that stump you see on the surface in the photos isn't Bluestone, it is a lead plate. Put there to protect the stump or is the stump still there? I can't find a reference to it anywhere. 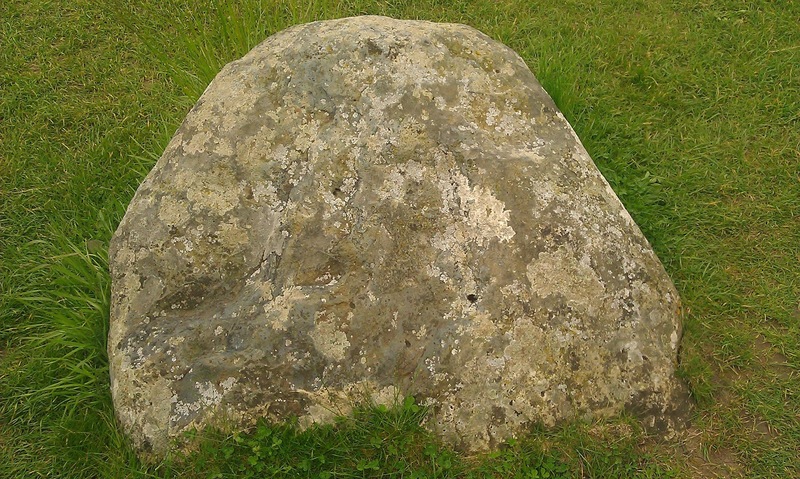 And it looks so like a Bluestone it is only by the closest examination can it be seen to be metal. Fake might be a little strong, as I'm sure there was no intent to deceive, but I'm not sure how else to describe it in a headline. 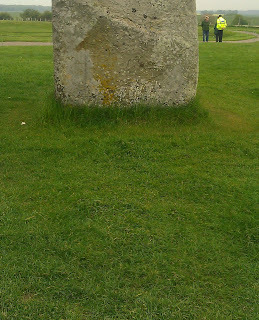 Always something new to discover at Stonehenge. Untouched by restoration Trilithon 51,52, 152 is the only one of the big five not to have been straightened or re-erected. 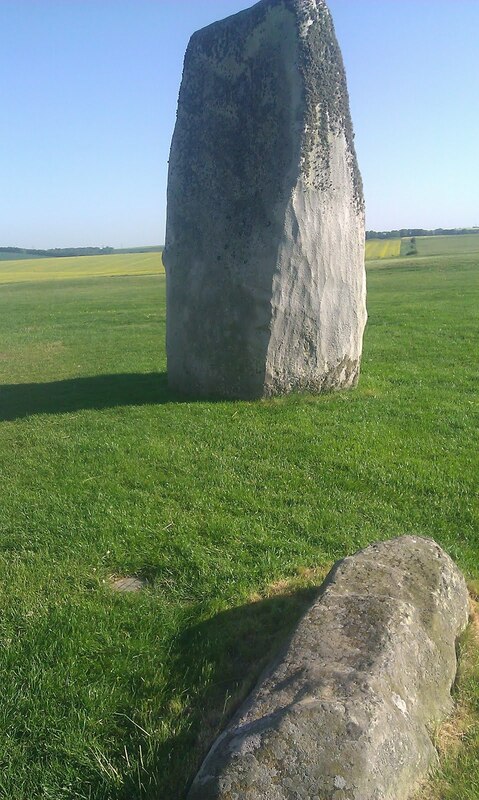 The Colours Of Stonehenge Stones. Red, White and Blue. 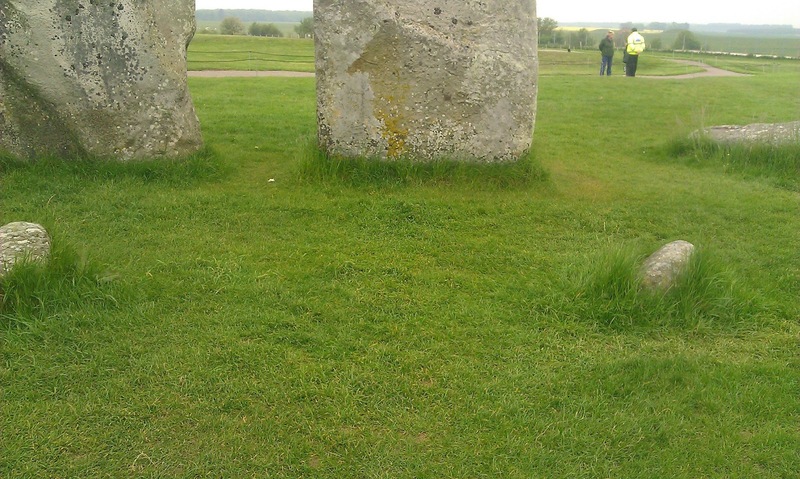 From a distance the stones of Stonehenge can all look disappointingly alike. But close up the colours are amazing. 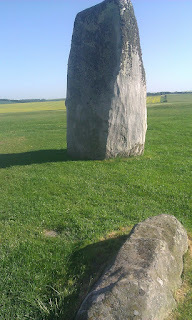 Some of the Bluestones are a deep blue, the Sarsens grey with Lichens adding splotches of white and the iron in the Sarsens staining the damp hollows deep red. 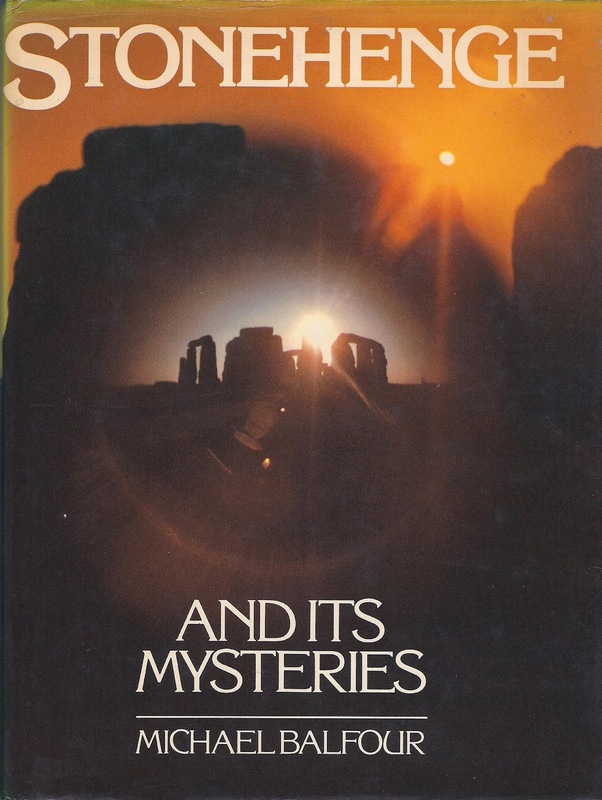 Browsing a book from a second hand bookshop - Michael Balfours's Stonehenge and its Mysteries - published in 1979 - I came across an intriguing photo captioned: "Custodian Griffiths in front of Stone 58 in March 1978, the week after the fence went up. 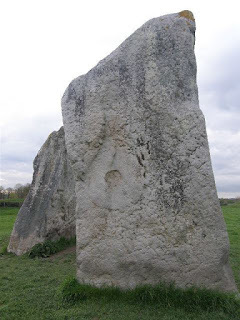 The four metal rods indicate the position of a stone which is buried encased in lead to preserve it"
Well it isn't Stone 58 pictured, it is Stone 23 on the outer ring. I took the liberty of taking shots of the same scene today. No sign of a stone or of a hidden buried one. 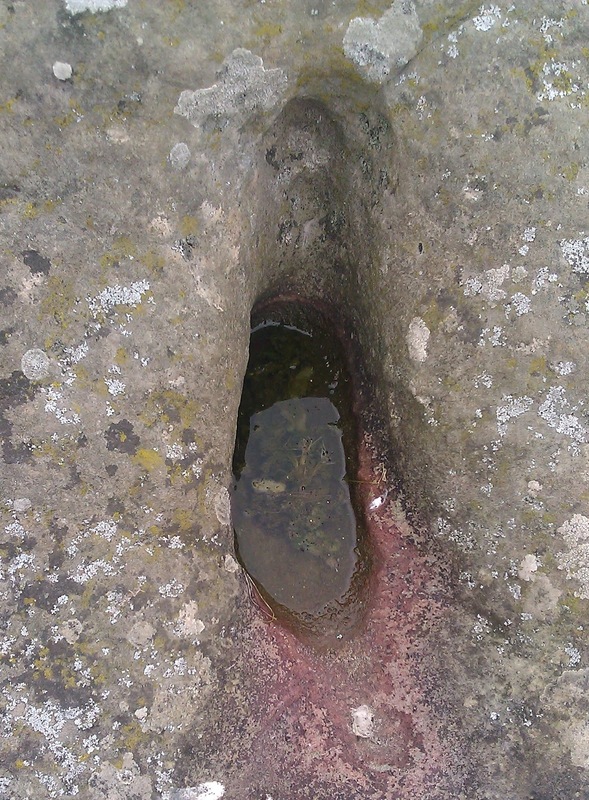 And why would a stone be encased in lead? So I dusted off my trusty Cleal and sure enough below the surface in front of Stone 23 there is Stone 42C, a buried Bluestone. Only a small stump and nowhere near the size of Balfour's lead encased monster, which looks be a lot longer than Custodian Griffiths is tall. So I think we can write off the lead encased buried stone as a myth. But the mystery doesn't end there. 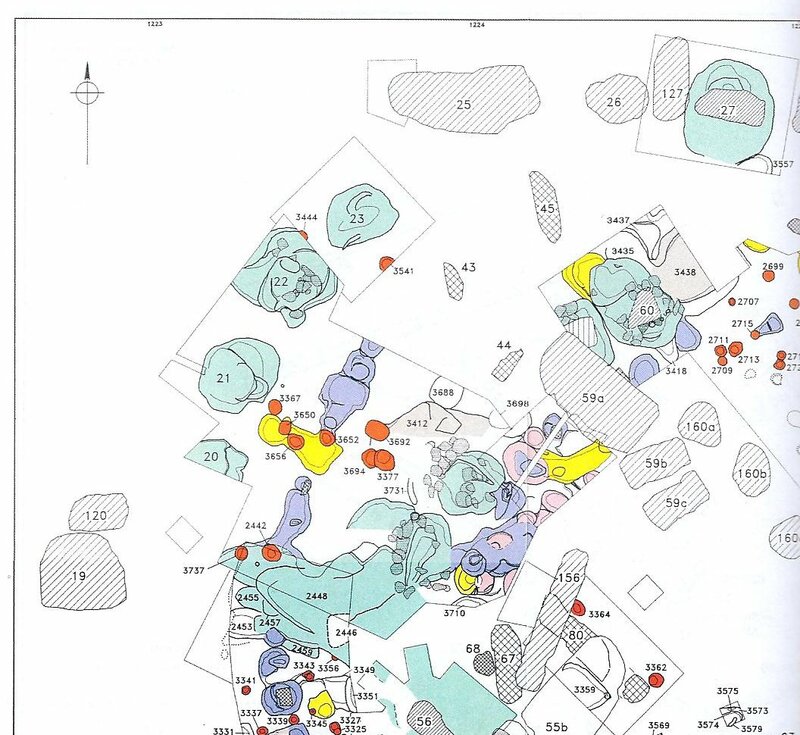 If we look at the excavation report in Cleal the area has never been dug. So how do we know what is under the surface? But wait, there's more! 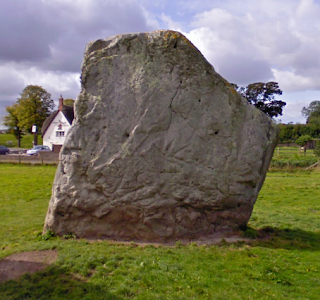 If we look at the Restoration Map in Cleal it seems that Atkinson (probably) removed and replaced stones in this area presumably as he was straightening Stone 60. 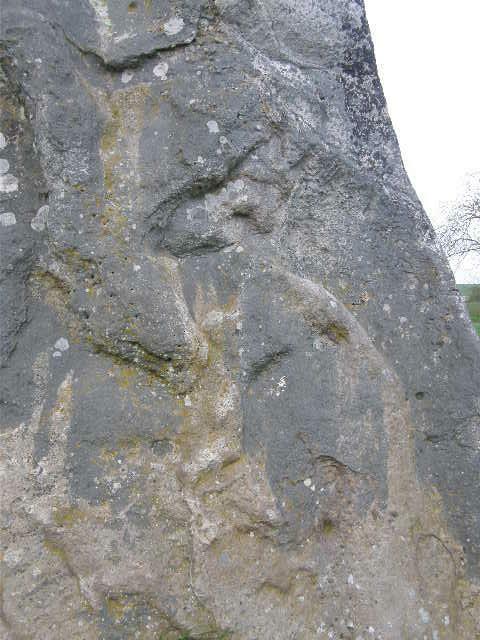 But no record of what he found as he did this appear in Cleal. 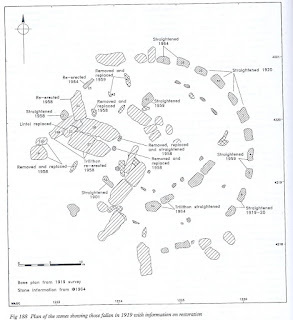 According to Atkinson, there are ten bluestone stumps. One (35) is above ground, and there are nine that are wholly buried beneath the surface: 32c, 32d, 32e, 33e, 33f, 40c,40g, 41d, 42c. 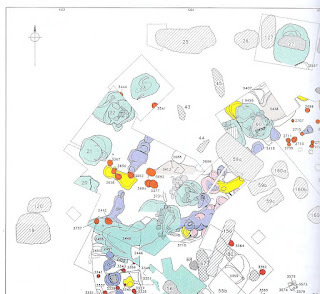 Of these, four (32c and 33e and 33f and 41d) are of "altered volcanic ash, dark olive-green in colour when unweathered, with a laminated fracture and a noticeably softer texture than the other bluestones." 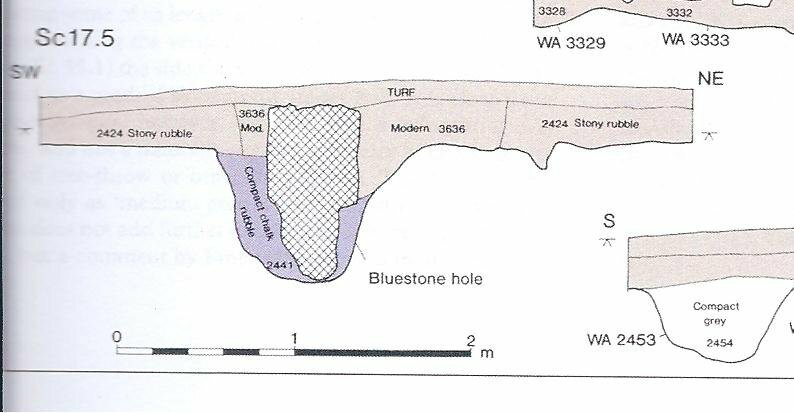 (Atkinson, p 48) Stone 32e is supposedly rhyolite, and stump 40c is a calcareous ash, referred to by Atkinson as a laminated blue rock. 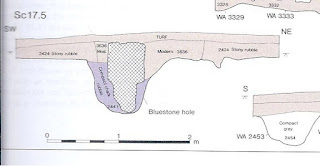 Stumps 40g and 42c are supposedly of Cosheston sandstone, "a blue-grey rock spangled with mica". 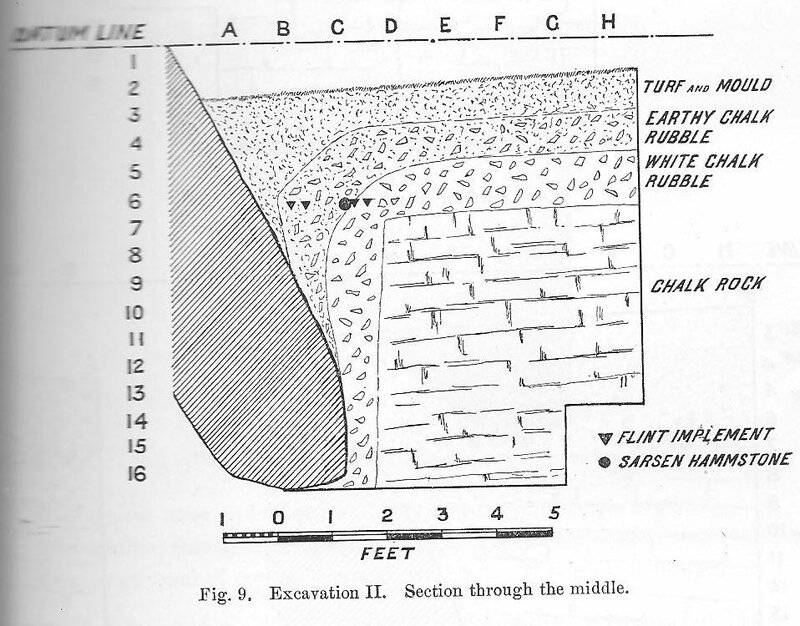 Mike Pitts on his blog asks; What’s that hole in Soane’s model? 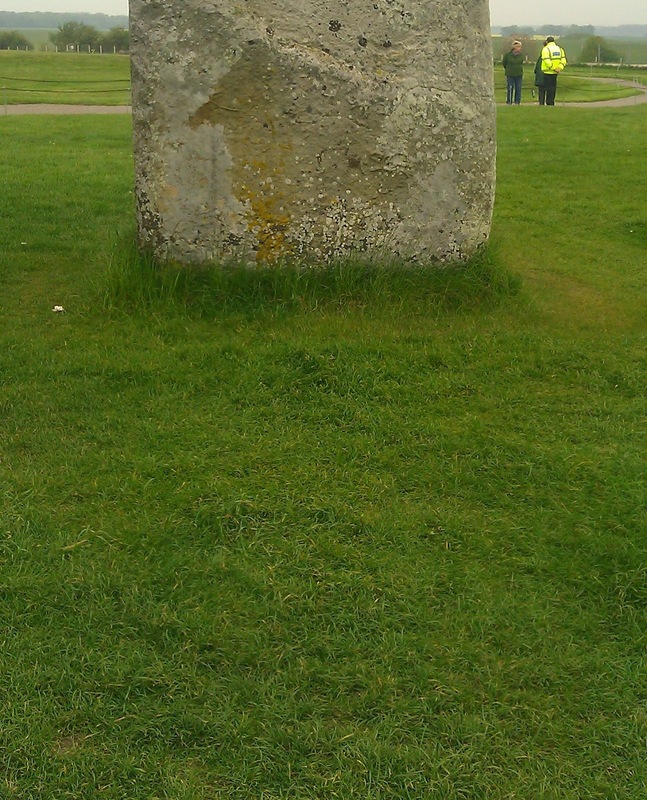 The centrepiece in Stonehenge: Monumental Journey is a cork model from the Soane Museum, brought out of store. 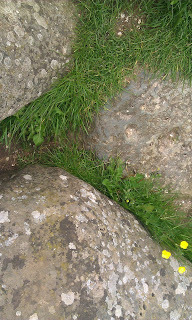 ...What’s interesting, and I hadn’t expected, is to see that the ground has been modelled as well as the stones. It’s not just a flat board, but a gently rolling, crumpled surface. 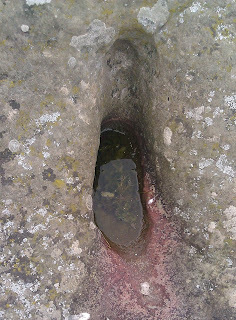 And what jumps out is what can only be the hollow left by an excavation, apparently by someone in search of buried stones, near the feet of the leaning trilithon stone 56. Did anyone know about that before? And if we didn’t, how many other furtive old hollows might have disturbed what we think of as ancient, pristine ground? 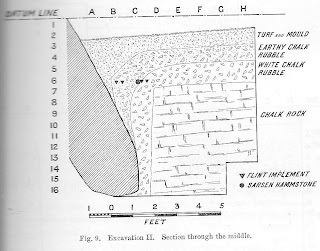 I think it might just be the hollow formed as the stone moved - Gowland's careful cross section of the rear of the stone before he straightened it shows there was a hollow that had filled with turf and mold. 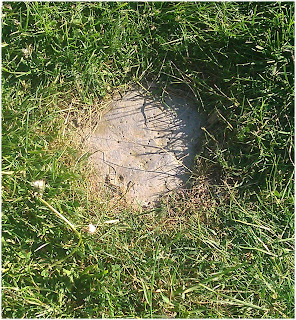 Or had someone dug down into this softer soil? 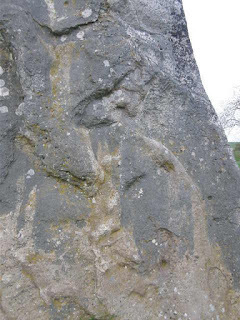 My colleagues Dan Rendell and Simon Banton have been noting strange figures on the sides of the Cove Stones at Avebury. A wheel, mill stone, the sun, or is it a doughnut? 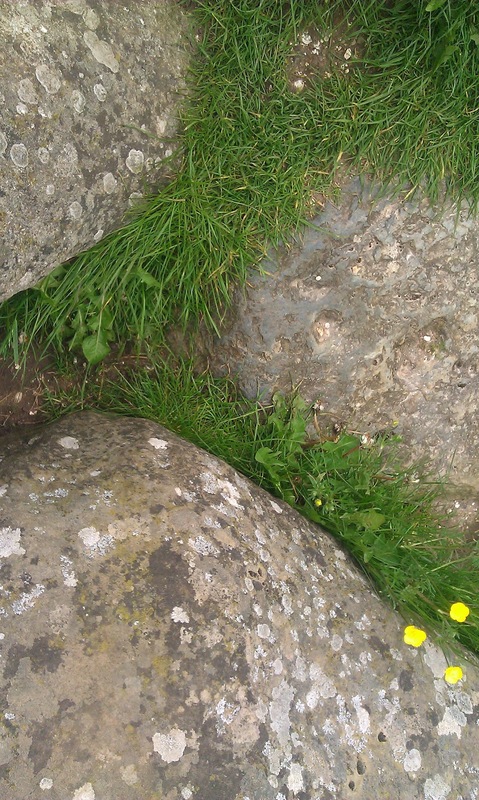 And can you spot the hare? An interesting report of a new scientific paper. 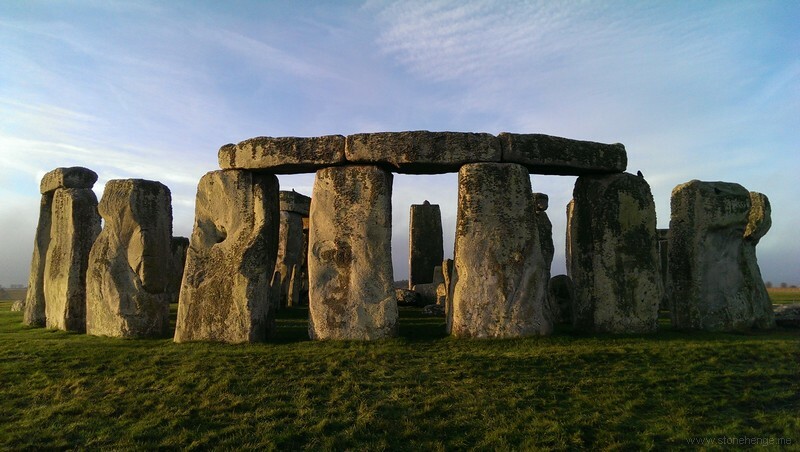 The study published online this week in Nature Geoscience reports the climatic change that occurred at the beginning of the pre-Roman Iron Age and demonstrates that especially the so-called Grand Minima of solar activity can affect climate conditions in western Europe through changes in regional atmospheric circulation pattern. 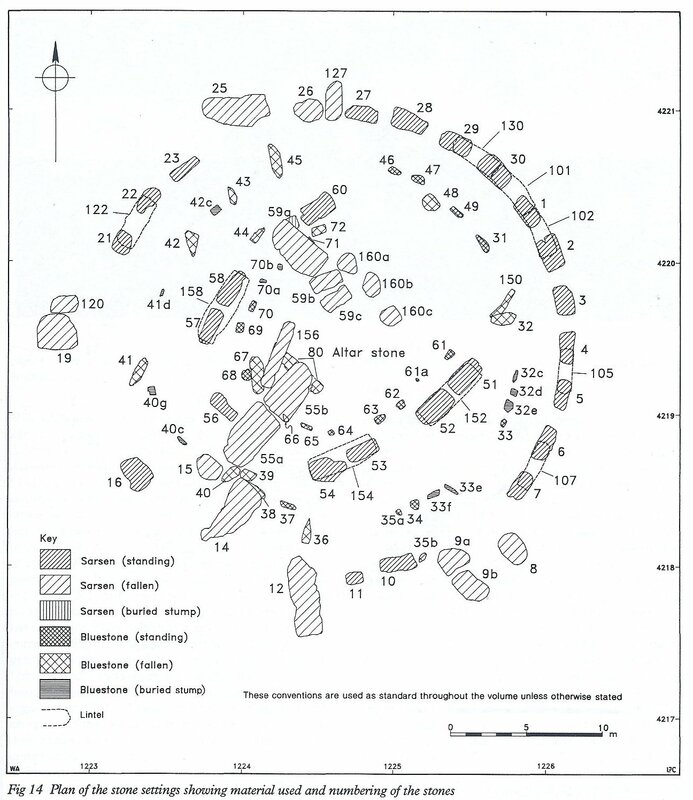 Around 2800 years ago, one of these Grand Solar Minima, the Homeric Minimum, caused a distinct climatic change in less than a decade in Western Europe.The exceptional seasonally laminated sediments from the studied maar lake allow a precise dating even of short-term climate changes. The results show for a 200 year long period strongly increased springtime winds during a period of cool and wet climate in Europe. 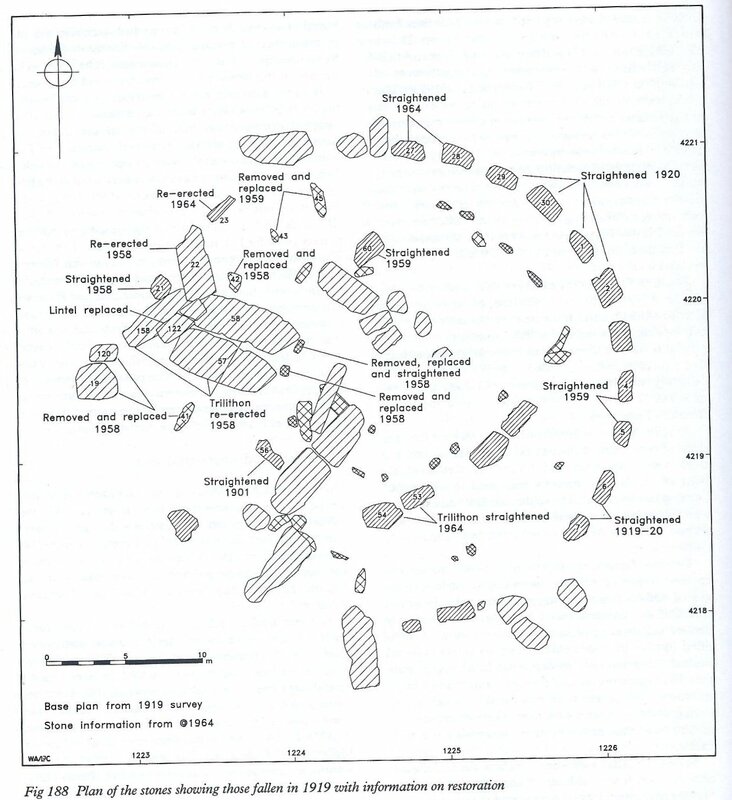 Now click on the graph - you will see the signature dip of the Homeric Minimum, and now look at around 2900 BC. The same dip in the Heliospheric Magnetic Field. 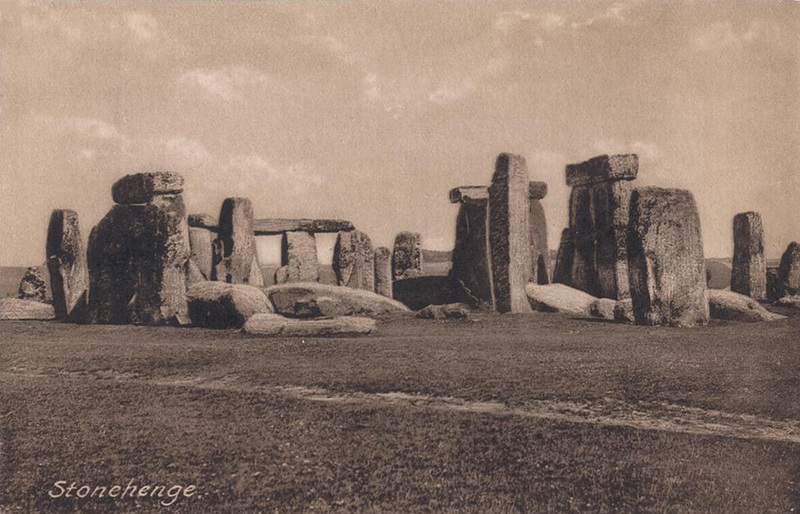 Does this imply another rapid climate change at the time Stonehenge was being built? Did the climate turn nasty so they built a temple? 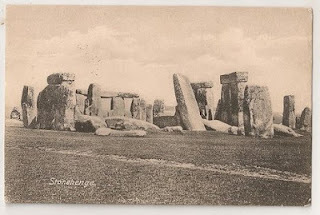 Or did they have to abandon building when the weather turned horrible year after year? 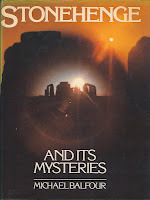 Or was there no change in the climate on Salisbury Plain? 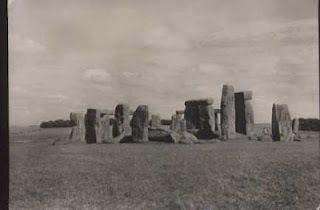 The bottom two are real pictures, the top two are two different faked photos dating from the early part of the twentieth century. The tall stone, stone 56, was straightened on the 19th of September 1901 and I guess that the postcard printers altered the picture rather than have a new photo taken. Which was a shame as on the evening of the 31st of December 1900, the trilithon on the left 22, with its lintel, was blown down in the course of a severe storm. So you can have stone 56 upright with 22 fallen or 56 leaning with 22 standing or for eighteen months 56 leaning and 22 fallen, but at no time in the early twentieth century were 56 and 22 both upright.